Newry, ME. – July 20, 2013. With four rounds of the 2013 Rally America Championship in the bag, defending champion David Higgins of the Subaru Rally Team is holding a commanding grasp on the 2013 championship point’s race as we head to Maine for round five. Canadian Antoine L’Estage and co-driver Nathalie Richard have reigned supreme in Maine taking the victory at the New England Forest Rally in the past three years. 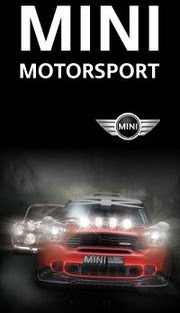 It was also in Maine in 2010 where Rockstar Energy Team clinched the 2010 Rally America Championship. L’Estage and Richard will return to Maine next weekend in their old Tiburon to chase down a fourth victory in a row. The 2013 season has been a mixed bag to date for the RockStar Energy Team of L’Estage and Richard. After a dramatic come-from-behind victory at Sno*Drift in January, their luck has gone from bad to worse. At round number two, Rally in the 100 Acre Woods, the team would suffer a DNF due to overheating on day one. At The Oregon Trail Rally in May, where the team would debut the WRC Mitsubishi, a very rare mistake by Antoine on stage 9 resulted in a spectacular crash. Fortunately, both Antoine and Nathalie were able to walk away unharmed. The WRC Mitsubishi did not come off as well suffering significant damage and therefore the car was returned to England for repairs. Antoine had planned to run the WRC Mitsubishi throughout the 2013 Rally America Championship. To help fund this program L’Estage rented his trusty EvoX to Ritfat Sungkar for 2013. With the WRC car back in England and Ritfat in his regular car, Antoine was without a car for STPR and therefore was forced to miss round 4. With sponsor commitments on the line L’Estage looked to rent a car for Maine. “We looked at several cars and were close to a deal on one, but for various reasons it did not happen,” said L’Estage. Without a confirmed car in place, it was looking somewhat bleak for L’Estage and Richard to make their return to the Rally American Championship in Maine. It was then that John Buffum of Libra Racing suggested that Antoine use his old Tiburon. 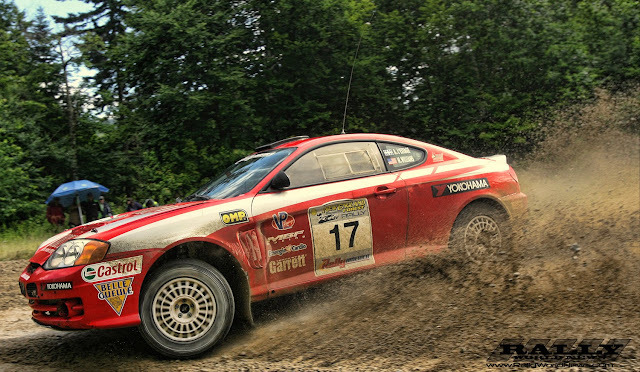 The Tiburon was retired from competition in 2009 when Antoine moved to the Mitsubishi EvoX. Without question, Antoine will definitely have his work cut out for him to get the victory, as it’s also a must win for Ken Block to keep his championship hopes alive. But as we have seen in the past, Antoine and Nathalie excel in Maine, and with Block and Higgins chasing the championship, anything can happen. Stay tuned for updates throughout the rally.